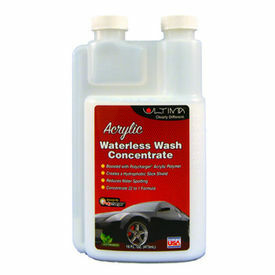 Ultima Acrylic Waterless Wash Concentrate 16 oz. Ultima Acrylic Waterless Wash Plus is the latest waterless offering from the company that brought us the most impressive waterless wash to date! Ultima Acrylic Waterless Wash Concentrate SAFELY cleans all surfaces without scratching. No hoses! No Rinsing! This Boosted by Acrylic Polycharger® formula not only cleans your vehicles’ surfaces, but it adds a slick hydrophobic shield protecting from harsh elements and harmful UV rays. Special high lubricating agents encapsulate dirt, bugs and grime so it is safely and easily wiped away without scratching. Greatly reduces water spotting. When using as a waterless wash, or a quick detailer, simply remove cap from chamber side, squeeze bottle and fill chamber to 1 ounce. Pour contents into Ultima Acrylic Waterless Wash mixing spray bottle or another 22 oz size bottle.Fill mixing bottle with water and shake. Lightly mist surface to be cleaned.Gently wipe using a clean, dry microfiber towel. Avoid contact with surfaces too hot to the touch. When using as a bucket cleaning method, add 2 ounces of concentrate to 3 gallons of water. Starting on upper surfaces first, wipe soaked microfiber towel in a back in forth motion in a small area (24” by 24”) at a time.